You made my day. This is wonderful. Glad you were there to get it! Oh what a beautiful photo. The bird the branches the sky. Just glorious! Beautiful!! My little chicadee! I have a lot of those come to my feeder but I just learned this year what they are. Love the birday picture against the blue sky. I love this one. Beautiful shot. I love it. My picture is similar to yours just a different Bird. Great Minds!! This photo is very relieving to the senses. Great shot! It's like white Christmas LOL! Perfect shot! I really heart it! Oohh what a cute little birdie with the beautiful blue sky behind! Awesome! Love the blue sky in the background! I'm afraid what we'll be watching tomorrow is snow falling from the sky - again! UGH!!! I love your chickadee photo! I love how they seem to be chewing their nails when they are simply cracking seeds open. Great shot. My Sky Watch is here. Thank you. That is marvelous! Love Love Love it! That's a beautiful image, excellent. Isn´t the little one a cute? And perharps a little shy? Nice photo. LOVE this! My favorite Sky Watch Friday picture today!! Hah! Anita stole me comment. Seriously, I was just going to write that this is IT. This is my favorite of the day. I love it. That's a great photo. I love the blue backdrop. Oh that is so neat .. the contrasts of colors and the composition are just perfect! You never cease to amaze me with your pictures. What a sweet little birdie! Look how blue that sky is. Gorgeous! This picture made my day! The ble colour and the silver/grey branch, is so beautiful. The little bird in the middle make it perfect!! I love this! Such a cute little guy. Do you think he feels alone in that tree....? Lovely weekend to you from Norway. What a gorgeous pic - that cute birdie, the blue sky and those silver branches - wonderful. BTW, check your Gmail account - I've left you a nice surprise. What a wonderful picture. I've been looking at it for at least ten minutes. It's gorgeous Misty. Great SkyWatch. The blue looks so pretty through the trees and the chickadee adds a great touch to it. the white branches and the blue sky is a perfect match along with the bird. You posted a bird like me! My blog is GOOD READING(BOA LEITUA). I love this pic. Chicadees help me make it through the winter! lol Beautiful composition. I have an award for you and you better post it. hehehe!! Love Ya Dork! Absolutely gorgeous! I ♥ it. I want to thank you for the award you gave me before and I would like to reciprocate your kindness. Please see my Thursday Thirteen and you'll see it there. Take care. 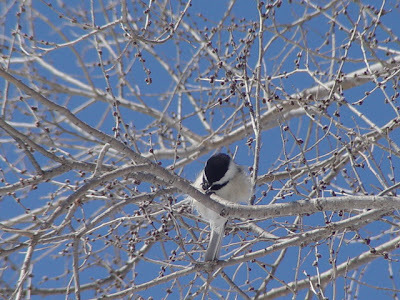 A chickadee and blue sky what a nice combination..very pretty picture. I like it. Beutiful picture.